Galveston, TX – April 28, 2015 – Galvez Bar & Grill at Hotel Galvez & Spa®, A Wyndham Grand® Hotel, announced today that it has been named a winner of the OpenTable Top 100 Best Brunch Restaurants in America. The list of winners is derived from more than five million reviews submitted by OpenTable diners for more than 20,000 restaurants in all 50 states and the District of Columbia. Galvez Bar & Grill is one of just four restaurants in Texas that made the list and the only one from the Houston area. "Brunch is the best way to extend the wonder of the weekend,” said OpenTable Chief Dining Officer, Caroline Potter, "We congratulate this year’s Top 100 Best Brunch award winners for creating menus and experiences that are a tribute to our favorite days of the week." Based on feedback collected from OpenTable diners between April 1, 2014, and March 31, 2015, the 100 award-winning restaurants received the highest scores. For more information about all of the restaurants on this list, please visit http://www.opentable.com/m/best-brunch-restaurants-in-america. Galvez Bar & Grill at Hotel Galvez & Spa serves Sunday Brunch weekly from 11 a.m. to 2 p.m. in the east loggia. Brunch offers a wide array of entrees in addition to a carving station, seafood display, made-to-order omelets, pasta bar, assorted pasties and fruits, soups and salads and a huge selection of desserts along with mimosas, champagne and a choice of red or white wine. Brunch is $39.99 for adults, $35.99 for seniors and $25.99 for children (ages 6-11). Advance reservations are recommended. The hotel is also hugely popular for its expansive holiday brunches scheduled on Mother’s Day, Thanksgiving, Christmas and Easter. Galvez Bar & Grill is open daily and serves breakfast, lunch and dinner. Reservations are available via Open Table or by calling (409)765-7721. OpenTable, part of The Priceline Group (NASDAQ: PCLN), is the world's leading provider of online restaurant reservations, seating more than 16 million diners per month via online bookings across more than 32,000 restaurants. The OpenTable network connects restaurants and diners, helping diners discover and book the perfect table and helping restaurants deliver personalized hospitality to keep guests coming back. The OpenTable service enables diners to see which restaurants have available tables, select a restaurant based on verified diner reviews, menus, and other helpful information, and easily book a reservation. In addition to the company’s website and mobile apps, OpenTable powers online reservations for nearly 600 partners, including many of the Internet’s most popular global and local brands. For restaurants, the OpenTable hospitality solutions enable them to manage their reservation book, streamline their operations, and enhance their service levels. Since its inception in 1998, OpenTable has seated more than 760 million diners around the world. The Company is headquartered in San Francisco, California, and the OpenTable service is available throughout the United States, as well as in Canada, Germany, Japan, Mexico, and the UK. Hotel Galvez & Spa®, A Wyndham Grand® Hotel and National Trust Historic Hotel of America, is the only historic beachfront hotel on the Texas Gulf Coast. This 224-room, century-old hotel offers 13,000 square feet of meeting space, a 9,763-square-foot spa, fitness center, full-service restaurant, lobby bar, pool with a swim-up bar and Hall of History. The hotel is rated four diamonds by AAA and is owned by the Cynthia and George Mitchell family as part of Mitchell Historic Properties. For reservations, call (409) 765-7721, or visit www.HotelGalvez.com. Part of Wyndham Hotel Group, Wyndham Hotels and Resorts, LLC, offers upscale hotel and resort accommodations at more than 190 properties throughout the United States, Canada, Mexico, Central and South America, the Caribbean, Europe, the Middle East and China. Most Wyndham® hotels are either franchised by Wyndham Hotels and Resorts, LLC or managed by Wyndham Hotel Management, Inc. with the exception of certain hotels which are franchised, managed or owned by an affiliate. Additional information and reservations for all Wyndham hotels are available by visiting www.wyndham.com. Travelers have the opportunity to earn and redeem points through Wyndham Rewards®, the brand’s guest loyalty program, which can be joined for free at www.wyndhamrewards.com. Wyndham Hotel Group is the world’s largest hotel company based on number of hotels, encompassing approximately 7,650 hotels and 661,000 rooms in 70 countries. Additional information is available at www.wyndhamworldwide.com. For more information about hotel franchising opportunities visit www.whgdevelopment.com. 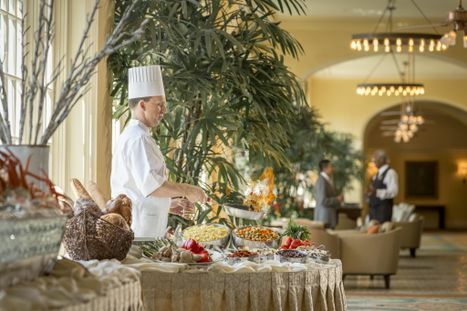 Hotel Galvez is widely known for its spectacular Sunday Brunch. Brunch always features a pasta bar, made-to-order omelettes, fresh seafood, carving station and more. Photo by Terry Vine.